Singer, songwriter, and record producer William “Smokey” Robinson was born on February 19, 1940 in Detroit, Michigan. Best known for his association with Motown Records, Robinson served as vice president of the legendary label from 1961 until 1988. 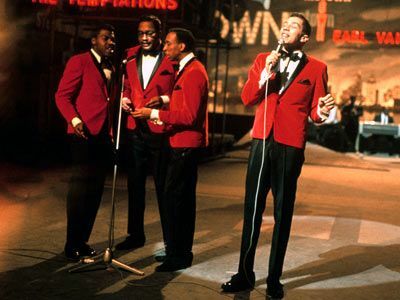 During that period Robinson, either with his group the Miracles or as a solo performer, had 37 Top 40 hits and was, next to founder Berry Gordy, the primary figure associated with Motown Records. Robinson spent his teenage years singing in local music groups while growing up in a rough Detroit neighborhood. Robinson’s “uncle” Claude who was actually a friend of his father’s, nicknamed him Smokey Joe, which Robinson initially thought was a cowboy name. He later learned it was a derisive term for dark-skinned blacks. Uncle Claude never wanted Smokey to forget his African heritage even though he had light skin and green eyes. In high school the nickname was shortened to Smokey. In 1955 Robinson co-founded The Five Chimes with Ronnie White, Pete Moore, Clearance Dawson, and James Grice. Two years later, in 1957, the group was renamed The Matadors when Claudette Rogers and Bobby Rogers replaced Dawson and Grice. In 1959 Robinson married Claudette Rogers. The couple had two children, Berry and Tamla, before divorcing in 1986. By 1958, with Robinson as the lead singer, the group now performed in local Detroit venues as the Miracles. Robinson met aspiring songwriter and producer Berry Gordy at one of those performances. The following year, 1959, Gordy started his own record label Motown, and signed The Miracles as its first recording group. In 1960 the Miracles recorded “Shop Around” which became Motown’s first number one hit and million selling record. The Miracles continued to produce hits through the 1960s but by 1969 their popularity began to decline prompting Robinson to consider retiring to concentrate on his administrative duties as Motown Vice President. The retirement was postponed with the unexpected success of the group’s 1970 single, “Tears of a Clown,” but by 1972 Robinson left the group to start a solo career. Beginning with the 1976 hit “Quiet Storm,” Robinson had a string of hits in the 1970s and 1980s. Although he left Motown when it was sold to MCA in 1988, Robinson continued to record albums. Ironically, his album, Intimate, was recorded in 1999 when he returned to Motown, now a subsidiary of Universal Music Group. Robinson was inducted into the Rock & Roll Hall of Fame in 1987 and in 1999 he received the Grammy Lifetime Achievement Award. William “Smokey” Robinson continues to record and perform in concerts around the world today.